Ingary is a land where 7-league boots and cloaks of invisibility really exist. It is also a place where it is commonly accepted that to be born the eldest of three is quite a misfortune as you will be the biggest failure. Sophie is the eldest of three girls and while disappointed with her probable future failure she really does want what is best for her sisters. When it appears they are taken care of she resigns herself to working in the hat shop. Even while keeping to herself Sophie somehow manages to attract the attention of the Witch of the Waste, who puts a curse on her turning Sophie into an old woman. The problem with being under a curse like this is the inability to tell anyone about it. Sophie refuses to let the Witch have the last say and sets out to get help. 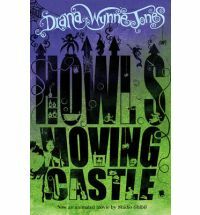 There is only one place she might be able to find the help she needs and that is at the darkly ominous moving castle. The castle belongs to Wizard Howl who supposedly eats the hearts of young girls. What Sophie finds there is not what she expects. Howl is quite different to what she believed he would be. There is a young apprentice, Michael and she makes a deal with a fire demon named Calcifer. There is more than one spell in desperate need of being broken, can Sophie overcome her fear of failure and help herself and those she cares most about? Sophie is a wonderful character who is stronger than she thinks. She is in some way resigned to her lot yet determined to have that on her own terms. She adapts well to her curse, embracing the change and making the most of it, with what is a times quite a scathing wit. Jones has created a wonderfully varied and visual environment to encapsulate a story that is layered yet in no way confusing. The characters are well fleshed out, full of light a shade, something which enables them to spring off the page. The plot is full of secrets, suspicions, crossed communication and general wrong assumptions, which when woven together by such a deft hand, make a tale that is a wonderfully funny, fantasy romp.